The new Cat 415F2 Industrial Loader Tractor combines the basic design of the Cat 415F2 backhoe-loader — including most of the frame, engine, transmission, and axles — with purpose-built components designed specifically for industrial-loader applications, such as new pilot controls, three-point hitch, and an available box blade scraper developed for the skip-loader market. The new model is available in canopy or cab configurations, standard 5-function rear valve and 3-function loader valve, dual location differential lock, low-effort pilot-type controls for the box blade scraper, and sealed storage compartment. An available security key pad disables the engine, transmission, and hydraulic systems at machine start-up until a pass-code is entered (25 pass-code capacity). Canopy models are fitted with a roof cap that reduces heat in the operator’s station, while allowing good sight line to the loader. Cab models feature an HVAC system with recirculation, wide-coverage pantograph wipers with great visibility and wide opening windows for ventilation. This machine also features either the cellular- or satellite-based Product Link™ telematics system. The standard three-function loader valve uses reliable mechanical controls, with single-lever control for models with a general-purpose (GP) bucket and two-lever control for models with a multi-purpose (MP) bucket (available with fold-over forks). Cat dealers can easily convert the GP system to the MP system. The five-function valve for the available box blade scraper uses low-effort, pilot-operated controls that feature a conventional operating pattern in a conventional control-console location. For added versatility, the rear valve provides a float function. The implement hydraulic system, load-sensing with a variable-displacement piston pump, produces a maximum flow of 35 gpm (132 L/min.) at a relief pressure of 3,336 psi (230 bar). A dual-tilt cylinder kit for the rear is available for the loader. 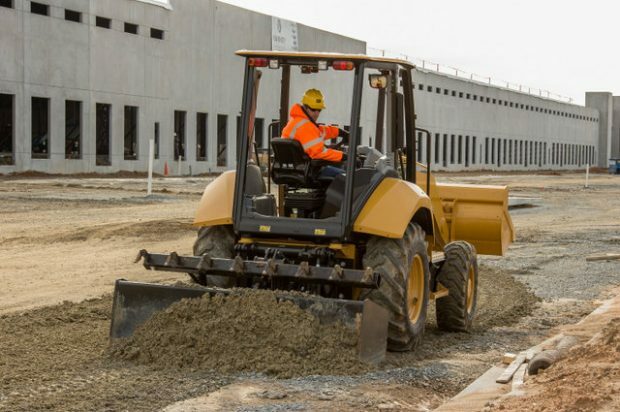 The 415F2 Industrial Loader uses a Cat C3.4B engine, rated at 72 net peak horsepower (56 kW), that meets U.S. EPA Tier 4 Final/EU Stage IV emissions standards with an under-hood diesel particulate filter and diesel oxidation catalyst; diesel exhaust fluid is not required. The new model is equipped with a standard-shift, four-speed transmission with a quick-reversing, power-shuttle feature. Also standard is a four-wheel-drive system (mechanical front drive) that can be used in two-wheel drive with four-wheel braking, which reduces tire wear and drivetrain wear. Brakes are wet multi-disc. Standard tires are 12 50/80-18 in the front and 16.9-24 rear. Front counterweights are available in 255-, 530-, and 1,015-pound configurations, and an optional rear counterweight weighs 198 pounds. The available box blade scarper features a Caterpillar designed wear plate that is reversible to significantly extend service life. The Caterpillar-engineered rear hitch, available in both single-tilt and dual-tilt configurations, has shortened hitch arms for optimum grading performance and a non-metallic wedge system to control hitch sway. For more coverage of Cat products, click this link. What? Are you a scaredy cat?